Patrick and Alejandra have dyslexic hearts. I've mentioned this before, but as a long time employee of Tower Records, Empire Records (written by an ex-Tower employee) is so much of a time capsule, very much like Singles capturing the grunge scene in Seattle. Empire really is pretty dead on in depicting the sillyness and mish-mash of personalities who worked at a record store, as well as the youthfulness, finding out about yourself and, of course, the music store chain era which ended in 2006. Yeah, that doc was pretty good, probably the best we're ever get about Tower, though Hanks being California based really focused on the Sunset Strip store the most - makes sense though as that was their flagship store. Best Buy and Big Box Stores is ultimately what killed us (Interesting to me because the writer for Empire saw this at least 11 years in advance of it happening). I remember towards the end there in 2006 getting my paycheck a couple times as a money order, haha. We knew something was up when that happened. 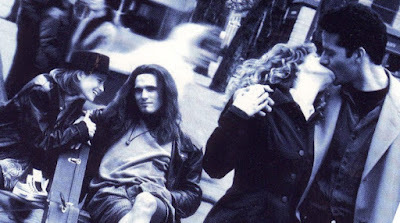 I am listening to the Singles soundtrack right now. It's pretty incredible. I've been looking for an excuse to rewatch this, and now I've found it! State of Love and Trust is my favorite Pearl Jam song. It's really the only Pearl Jam song I love. The movie probably has a great deal to do with that. Yes great soundtrack. Live Soundgarden clips in the movie also rule. I dunno, if you like "emotionally exposed" characters, and thats a great way to put it, you'll love Phantom Thread. Chicago had a great scene with Tortoise, Seas and Cake, Shellac, Wilco and the great, now defunct electronic/indie label, Hefty records during that time. Never became mainstream but the Chicago underground scene was really strong from an outsider of the city. Besides Wilco (the biggest name I mentioned) were these bands as least more respected/represented in Chicago than anywhere else? I guess my question relates to "we're huge in Belgium ". Were they huge in Chicago? "Sea and Cake" not "seas"...ugh. That screaming trees song is my jam! I wouldn't mind a show where Patrick just tells Alejandra about life in the 90's. Darn it! This podcast has got me in the movie geek wormhole that the Katherine Heigl/Rosario Dawson film that Patrick couldn't remember is called Unforgettable AND directed by Denise Di Novi who produced Practical Magic! pps. Great podcast as always and great to hear Alejandra again! So Stoked for the Replacements shout out. Let It Be is there best work as a whole, IMO. But, I usually tell people the side 2 of Tim is their best record. Just side 2. Now when is the Empire Records podcast? Hi Patrick, you said you watched almost 100 movies in Jan. Do you have a place where you keep a list? or maybe a rating for each? I did recently start using Letterboxd to track what I'm watching for the purposes of the 'seen anything good lately' section of the podcast. Would that help? Yes that would help. I'm always interested in what people watch even if I don't have the time. My goal is usually 100 films a year. You made a joke of that goal by watching 100 in a month haha. This just showed up on Filmstruck, in case anyone is looking for a way to watch it.